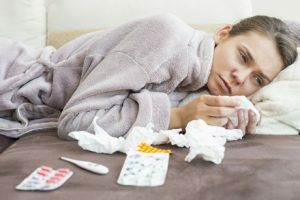 How do I care for my teeth when I’m sick? 2. Swish and spit after vomiting to wash the acid off. Wait about 30 minutes to brush your teeth so you aren’t brushing the acid around. 3. Drink lots of water to stay hydrated. If you must reach for tea or sports drinks for electrolytes try to choose sugar free. 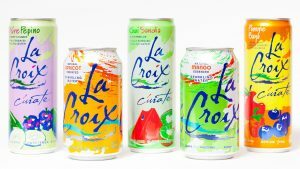 Plain fluoridated water is still the best option, but sparkling is far better than soda or sugary drinks. Sparkling waters don’t damage your enamel the way sugary drinks do. You should be careful, however, not to drink too much citrus sparkling water. Citrus flavors have a lot more acid which can eventually breakdown your enamel. The ADA recommends not sipping on sparkling waters throughout the day but instead trying to finish it off during mealtime. 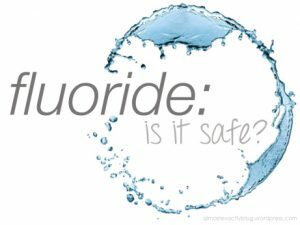 Is It Okay for My Child to Drink Water with Fluoride? Yes! It’s one of the best ways to prevent cavities for children and adults. Rancho Santa Margarita has fluoride in their water which helps strengthen teeth and prevent decay. Fluoridated toothpaste should also be used daily. Here’s an easy way to remember! Brush your teeth twice a day for 2 minutes. Floss between your teeth daily. Flossing will remove plaque and leftover food that the toothbrush can’t reach. Eat a balanced diet and limit snacks in between meals. Visit your dentist regularly for professional cleanings and oral exams. Call us today or you can schedule your cleaning online! 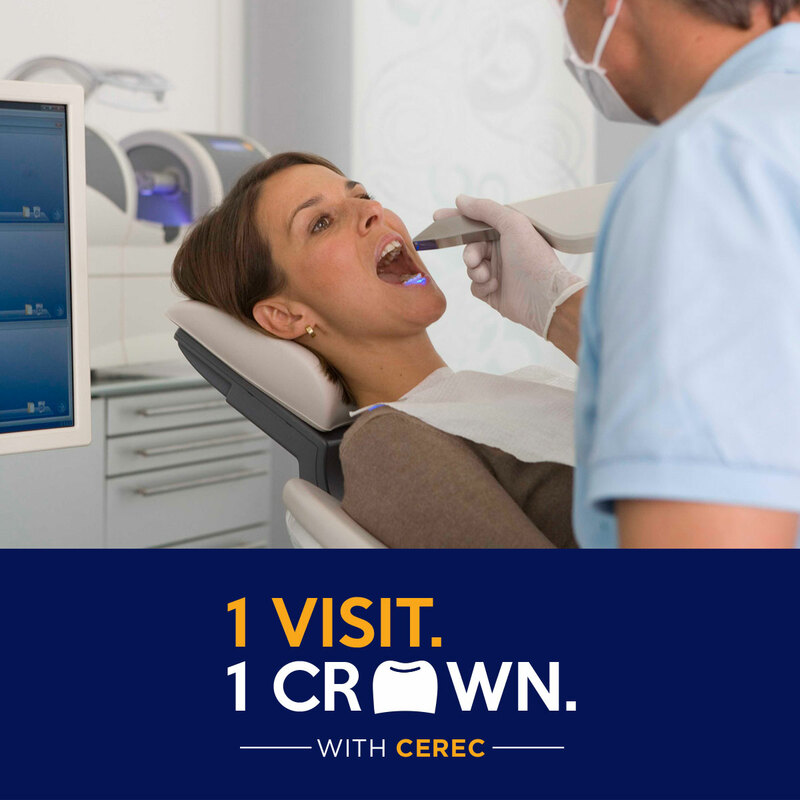 Get your crown done in just one visit! Crowns are an integral part of many dental restoration treatments including implants, root canals, or simply covering and strengthening a tooth that’s damaged by trauma or decay, but getting a crown done has traditionally been very inconvenient! 1) You needed an appointment to prepare the tooth, make the impression, and place the temporary crown. 2) You needed to wait (possibly two weeks) while your permanent crown was milled (created) at a dental lab, then sent back to us. 3) You needed a SECOND appointment for us to remove the temporary and place your permanent crown. But now Penrod Dental Care uses CEREC so you can get your permanent crown in just one appointment! CEREC is new CAD/CAM technology we have here in our office that allows us to mill your new, custom, perfectly crafted permanent crown during ONE VISIT. No need to take more time off work, no temporary crown, and no chance that you may need to be numbed twice. Here at Penrod Dental Care we make it a priority to provide you—our valued patients and friends—with the best experience possible. One of the ways we achieve that is by keeping ourselves on the leading edge of technology and convenience. So if you’ve been waiting to deal with that crown until it was convenient—it’s time! Let us know if you have any questions about our CEREC technology and if you know someone who may be interested in one-visit dental crowns as well, let them know about us! Feel like your smile is looking a little yellow or missing some sparkle? You aren’t alone! When the American Academy of Cosmetic Dentistry asked people what they’d most like to improve about their smile the most common response was whiter teeth. Whiter teeth can help you look healthier, younger, and more self-confident. Whitening your teeth (also called bleaching your teeth) is a pretty simple process. Whitening products contain a type of bleach that helps break stains into smaller pieces, making the color less concentrated and your teeth brighter. There are different types of whitening products, each a different fit for budget and time constraints. Talk to your dentist about the best whitening program for your situation. Whitening toothpastes help remove surface stains (not deeper stains) through the action of scrubbing the teeth with a mild abrasive. Unlike bleaches, these types of products only remove stains on the surface and can’t change the actual color of the teeth. In-Office Bleaching means the dentist will apply protection to your gums, and then put bleach directly on the teeth. A special light might be used to enhance the action of the whitening agent. This is a good option if you need a significantly brighter smile tomorrow. At-home bleaching uses a bleaching gel and trays that are made to fit your teeth. The gel is a lower concentration of bleach than used in an in-office bleaching visit, so this may be a good option if you have sensitive teeth. At-home bleaching can also be done with store-bought trays or strips, but the best option is to get custom-fit trays from your dental office. Teeth bleaching may not work on teeth that have fillings, crowns, veneers, or other problems. It is always important to talk to your dentist before beginning any bleaching treatments to avoid making discolored spots look worse in comparison. Although there are rarely side effects of bleaching your teeth, some people do find they feel sensitivity when they whiten their teeth. This happens when the peroxide in the whitener gets through the enamel of the tooth to irritate the nerve of the tooth. This sensitivity is almost always temporary. Talk to your dentist if you feel you need a lower concentration to avoid this problem. Overuse of whiteners can also damage the tooth enamel or gums, so be sure to follow directions and talk to your dentist. Teeth whitening, or bleaching your teeth, is a simple process that can make a huge difference for your smile. Call our office today to start your path to a whiter, brighter smile! Although thorough brushing and flossing help remove food particles and plaque from smooth surfaces of teeth, sometimes toothbrush bristles cannot reach all the way into the depressions and grooves of other teeth to extract food and plaque. Dental sealants are a barrier that helps protect these vulnerable areas by “sealing out” plaque and food. Sealants are a thin, plastic coating applied to the chewing surfaces of the back teeth (premolars and molars) where the grooves and depressions mean decay is most likely. The sealant is painted onto the tooth enamel, where it bonds directly to the depressions and grooves (pits and fissures) of the chewing surfaces of back teeth, then hardens. The sealant acts as a barrier, protecting enamel from plaque and acids. As long as the sealant remains intact, the tooth surface will be protected from decay. Sealants hold up well under the force of normal chewing and may last several years before a reapplication is needed. During your regular dental visits, your dentist will check the condition of the sealants and reapply them when necessary. Regular visits will make sure that they don’t break down without anyone noticing. The likelihood of developing decay in those deep pits and fissures begins early in life, so typically children and teenagers are the main candidates for sealants. Sealants help protect the teeth through the cavity-prone years of ages 6 to 14. However, adults without decay or fillings in their molars may also benefit from sealants. Call us if you have more questions about sealants and the important role they can play in your dental health program. Why Do I Have To Wear A Mouthguard? Approximately 15 million children participate in organized sports in the United States, and each season there is a 10% chance that they will receive an injury to the mouth or teeth. For any athlete playing a sport, a mouthguard is an essential piece of athletic gear that should be part of your standard equipment from an early age. In fact, studies show that athletes are 60 times more likely to suffer harm to the teeth if they’re not wearing a mouthguard. While collision and contact sports, such as boxing, are higher-risk sports for the mouth, you can experience a dental injury in non-contact activities too, such as gymnastics and skating. In fact, while most people think of football as one of the most dangerous sports, a basketball player’s risk of orofacial (having to do with the mouth, jaws, and face) injury is 15 times that of a football player! Boston Celtics forward and team captain Paul Pierce has some personal experience with orofacial injuries: two of his own teeth were broken during a 2002 game against the Phoenix Suns, and during a November 2008 game, Pierce was involved in a loose ball scramble that resulted in Indiana Pacers forward Danny Granger losing two teeth (see photo above). In these two instances, neither player was wearing a mouthguard, which meant that both had to spend time and money off the basketball court and in the dental chair to repair the damage. Mouthguards, also called mouth protectors, help cushion a blow to the face, minimizing the risk of broken teeth and injuries to your lips, tongue, face or jaw. But all mouthguards are not created equal. A custom-fit mouthguard greatly increase the protection through a more form-fitting appliance. The tighter the fit, the less chance the mouthguard will fall out during impact, and the mouthguard can do its job to protect you.. Custom mouthguards spread the force of the blow over all the teeth that are covered by the mouthguard. They stop violent contact of upper and lower teeth. They also keep lips away from misaligned teeth, which protect the lips, teeth and orthodontic treatment (example: braces). Mouthguards always hold the jaws apart to act as shock absorbers and prevents upward and backward displacement of the condyles in their fossae. This alone can help reduce concussions.They also can help cushion a blow that could cause head or neck injuries, injuries to the jaw, or even concussions. Stock These are inexpensive and come pre-formed, ready to wear. Unfortunately, they often don’t fit very well. They can be bulky and can make breathing and talking difficult. Boil and bite These mouth protectors can be bought at many sporting goods stores and drugstores and may offer a better fit than stock mouth protectors. They are first softened in water (boiled), then inserted and allowed to adapt to the shape of your mouth. A properly fitted mouthguard may be especially important for people who wear braces or have fixed bridge work. A blow to the face could damage the brackets or other fixed orthodontic appliances. A mouthguard also provides a barrier between the braces and your cheek or lips, limiting the risk of soft tissue injuries. A custom-fitted mouthguard is also more comfortable and more likely to be worn. If you wear braces or another fixed dental appliance on your lower jaw, your dentist may suggest a mouth protector for these teeth as well. 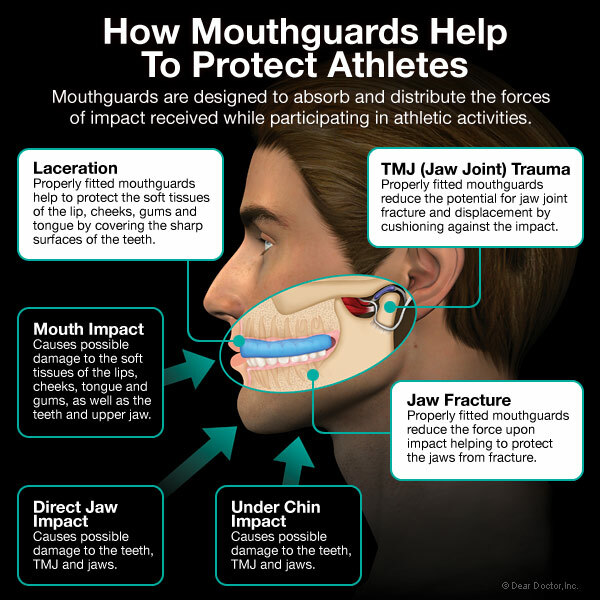 For younger athletes it is important to remember that the mouth is still evolving and growing, so it may be necessary to revisit the fit of your mouthguard and make sure it is still offering the best protection possible. Your dentist can help you select a mouthguard that will provide the best protection throughout your athletic career. More than 80 million people suffer from chronic halitosis, or bad breath. In most cases it originates from the gums and tongue. Bad breath can be very embarrassing, but it is a common condition and there are numerous ways to fight it. Following these tips can help you fight bad breath as well as keep your mouth healthy on a daily basis. If you feel that your halitosis might be worse than normal, give us a call! 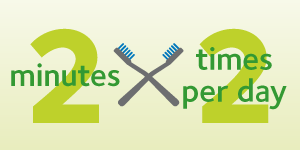 Brush your teeth two to three minutes at least twice a day to remove plaque and food debris. It’s very important to brush your teeth before going to bed. You might try an additional round of brushing with baking soda to reduce the acidity in the mouth and make it difficult for the bacteria that cause bad breath to grow. Flossing will remove food debris from in between the teeth that a toothbrush can’t reach. If the food debris is not removed, the bacteria will begin to feed on it, causing bad breath. To remove any residue that may be building up between the taste buds and folds in the tongue, invest in an inexpensive tool called a tongue scraper, which is available in drugstores. If you don’t have a tongue scraper, you can use your toothbrush to brush your tongue. Keep in mind that if a dental problem is the cause of chronic bad breath, a mouth rinse will only mask the odor and not cure it. In some cases, mouth rinses may actually worsen a bad breath problem by irritating oral tissue. For an emergency freshen-up, try a quick rinse with a mix of water and a few drops of peppermint oil. Or rinse your mouth with black or green tea: according to a study by the University of Illinois at Chicago, rinsing your mouth with black or green tea suppresses the growth of bacteria that cause mouth odor. Quit smoking and avoid tobacco products. If you ever needed another reason to quit, here’s an easy one: smoking contributes to bad breath. Tobacco tends to dry out your mouth and can leave an unpleasant smell that lingers even after brushing your teeth. Be sure to drink a sufficient amount of water (six to eight 8-ounce glasses) daily to avoid dry mouth. Drinking water will help keep odor under control because it helps wash away food particles and bacteria, the primary cause of bad breath. If you have chronic dry mouth or take medications that cause you to have dry mouth, talk to your dentist about recommending an over-the-counter saliva substitute. Eat a piece of sugarless candy or chew sugarless gum. If you have dry mouth, try sucking on a piece of sugarless candy or chew sugarless gum to stimulate saliva flow. The saliva will help to wash away food debris and bacteria that cause bad breath. Munch on a carrot, a stick of celery or an apple. Snacks of crispy, fresh fruits and vegetables step up your saliva flow between meals to help wash away bacteria from teeth, tongue and gums that can cause bad breath. These snacks can also help alleviate bad breath caused by hunger or fasting. An empty stomach from skipping meals can cause foul breath as acids in the stomach build up. Parsley adds more than a green garnish to your lunch plate; it’s also a breath-saver because it contains chlorophyll, a known breath deodorizer. So pick up that sprig on your plate and chew it thoroughly. Or toss a few handfuls in a juicer and sip the juice when you need to refresh your breath.